All over the web, people are signing up for the A to Z Challenge – which starts April 1st. Blog from A to Z starting with A on the first, B on the 2nd… take Sundays off and end at Z on the 30th. I’m proud to be part of the great A to Z Theme Reveal Blogfest! All the bloggers listed below have selected a theme for their A to Z Challenge and today we are revealing everything to the world! I’ll be blogging through April using the words in the graphic as my inspiration. Watch out for the Giveaway, too! Thank you, wordle.net for the graphic. Now go see what others are doing – and leave a message before you go! ← Friday Flash Fiction: Hijack! Thanks, Aditi! I love those word pictures but only found wordle last year when I needed something for a conference. Then I had to remember where it was again! Visiting from A/Z Theme Reveal. That does sound like an interesting theme. Cute graphic with it too. I will be curious to check back and see what you write about. Good luck with the challenge! intriguing and unique! *curious* Good luck! Thanks, S(t)ri. Good luck with yours, too. Sounds interesting. Wouldn’t mind some additional details, but looks like you have all the letters covered. The theme is emitting a lot of promise to instill excitement. This sounds interesting, I can’t wait to see it! Thanks, Steve. Are you still on holiday? What a great theme. I’m looking forward to learning a bit on my visits here in April! Just posted my theme reveal! I’m excited to see if people like what I’m doing! You know, I always wondered where that alphabet came from- this is such a cool choice! Thanks, Beverly. It was an inspiration that came when I was working on my new book title! Wow! That’s an interesting theme! Oooh, this looks very interesting, Jemima! Looking forward to your daily dose of Nato Phonetic magic! resident bartender for A to Z Theme Reveal Party! Golf-Oscar-Oscar-Delta Lima-Uniform-Charlie-Kilo! 😉 Looking forward to reading your posts. Wow, unique topic, that’s for sure. I shall follow your A-Z’s closely. Anything I can learn from is of great interest to me, and this sounds intriguing. Great choice, Jemima. Thanks, SD – there are indeed a lot of great themes around. Looking forward to seeing yours! So many interesting words in this theme. I wonder waht you will come up with! Looking forward to your posts! Some were more challenging than others – and some are yet to be written, since on Fridays I am still doing my Flash Fiction challenge, and the challenge is set weekly! Thanks, Nicole. I didnt know I was going off the beaten path at all! Sounds like a fascinating theme….looking forward to reading your posts! What a smashingly great idea! Team Damyanti certainly is on a roll! Best of luck, and awesome graphic you found! I love how distinctive the themes are this year– and I’m loving yours, Jemima! Thank you for being on the team, and such a lovey presence all around. Thank you also for all the support on social media and your blog– I think, together, the Magnificient 7 are going to rock this challenge! The themes are wonderful, aren’t they. I’m pinning them on my Pinterest board so I can find them again more easily! This looks interesting! I’ll be back to check it out. Thanks, Larry – looking forward to seeing you again – often! I suspect I think of really cool themes when visiting people each year. The trouble is remembering them! I know I was planning a haiku theme for a long time – then I had to retitle my new book. It’s all V for Victor’s fault! I started in 2012 so I didnt see that one. I wonder whether we’ll have any uses of the word in common? Probably Foxtrot – it was really hard to think of a new slant to that one. What an interesting choice. Some will be quite difficult. Should be fun. Thanks, Rhonda – yes, you’re right, some are giving me trouble! The worst ones will be the Friday ones as I do a flash fiction challenge, and I only find out what that is a week before and will have to include the word of the day – for Delta, Juliet, Papa and Victor! And your theme sounds great… love the spontaneity! Or have you pre-written them? Also wondering whether they are fiction/non-fiction? Mostly it will be non-fiction, but Tuesdays word will inspire a haiku, Friday’s is flash fiction and Saturday’s is a book review – sometimes with only loose connections to the word of the day! What an interesting theme you have here. Can’t wait to see how it all plays out. Born into the Air Force, married the Army, and now working for the Navy and Marine Corps, this intrigues me! Well, you’d know these codewords backwards, then! Good luck with the challenge, Jamie! Interesting. I shall look forward to this. Oh that must have been awful! I do hate cube farms – I hate people being able to hear me on the phone anyway! Colorful… I like it! And I just may learn something. Can’t wait to read your posts! This is a fascinating theme! Look forward to the posts, which I am sure will be as fascinating. All the best! Thanks, Beloo! I hope it lives up to your expectations! Just returning your visit to my blog :). What a superb interpretation. I look forward to seeing your posts for each word. Thaks, Tasha. Good luck with yours, too! I’m intrigued by your theme! Can’t wait to see what you do with it. Cool theme; very unique. 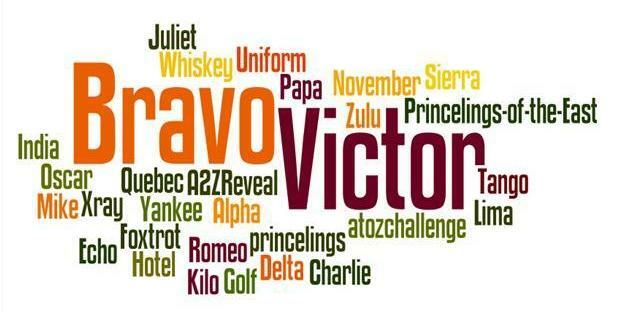 I know a few of the NATO phonetic alphabet, but I look forward to learning more! Interesting theme! Like all great ideas, it sounds simple after I’ve been told about it. My theme, ‘26 Positive Takes on Life’ will generally focus on positive, truly heart-warming, real-life incidents involving ordinary persons whom we can all emulate. I am intrigued! I can’t wait to see what you do with this! Thanks Melanie – you too! I think they’re all tough, Rubina – but we will rise to the Challenge! Good luck!